A ship enters the Miraflores Lock while passing through the canal. Charles the 5th, the Holy Roman Emperor and King of Spain, had a problem. A few years before in 1532 Francisco Pizarro, a Spanish conquistador, had defeated and captured the Inca Empire in Peru. The mines of that country were now producing a wealth in silver to be sent back to Spain, but the trip required ships to travel thousands of miles all the way around the tip of South America before they could make their way eastward across the Atlantic Ocean to Europe. The king pondered if perhaps there wasn't a better way. In 1513 Vasco Nu�ez de Balboa had discovered that in Central America there was just a narrow strip of land, not much more than 50 miles (80km) wide, separating the Atlantic from the Pacific Ocean. Suppose a canal could be dug through that strip of land? It would not only shorten the trip from Peru for the Spanish vessels, it would give Spain a tactical military advantage against its rival in the new world, Portugal. Though the distance was only fifty miles it was one of the most difficult landscapes imaginable to work in combining dense jungles with steep mountains. King Charles ordered the Panama regional governor to survey the area for a canal following the route of the Chagres River. The governor came to the conclusion, however, that building such a passageway through the rugged terrain would be impossible. -Made of: The three sets of locks are composed of concrete and steel. Other: 268 million cubic yards of earth were removed, more than 14 times what was excavated for the Suez Canal which is twice as long. Charles' survey was probably the first serious look at building a ship route across what we now call the Isthmus of Panama, but it would not be the last. When Ulysses S. Grant led a group of soldiers across the isthmus, part of the country of Columbia in those days, while traveling to a post in California in 1852, he became interested in the project. Later he sent several expeditions to the area to look at the possibility of a canal after he became the 18th President in the late 1860's. The first serious attempt to build a canal, however, wasn't made by the Americans, but by the French in 1880. Ferdinand de Lesseps led the project to build the canal. Eleven years before he had successfully completed the construction of the Suez Canal in Egypt connecting the Mediterranean Sea and the Red Sea. The Suez Canal had revolutionized shipping by letting vessels avoid the long trip all the way around Africa to get from the Far East to Europe. De Lesseps thought that a canal across the Panama Isthmus would do the same thing for the Americas. Though the Suez Canal was almost twice as long as the one planed for the isthmus, the terrain there was flatter, making construction easier. In Panama, de Lesseps planned to build a sea-level passage just like he had done at Suez. To make this design work, however, the path of the canal must be dug out all the way down to the level of the oceans so the water can flow freely between the two bodies. This worked well at Suez where the path of the canal covers ground that is only slightly higher than sea level. In Central America, however, it created immense problems. Millions of tons of rock and soil needed to be moved out of the way. Because de Lesseps failed to have a thorough review of the geology of the region done before starting out, the cuts he made through the mountains were too steep. The frequent rains caused erosion and landslides to occur that would fill the excavations nearly as fast as they could be dug out. Even more of a problem than the landslides was the health of the construction workers. Jungle diseases like yellow fever and malaria were rampant among the employees. By 1889 when the French finally gave up the project, almost 22,000 lives had been claimed, some by construction accidents, but most by illness. By that time the Americans had become interested in building a canal. 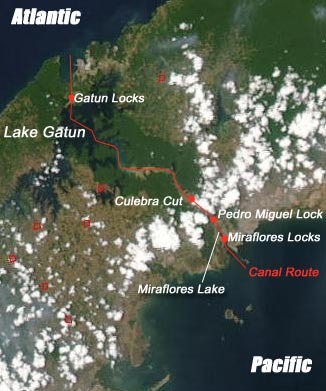 They considered an alternate route across Nicaragua, but in 1902 the U.S government decided to purchase the rights to continue the canal from the French for what was then considered a reasonable price: $40,000,000. To firm up their claim in the area, in 1903 the United States supported a revolt in the Panama region against the Columbian government. On November 3rd of that year, Panama declared its independence and the United States immediately recognized the new nation. Through Philippe Bunau-Varilla, a Frenchman serving as Panama's new ambassador, the U.S. negotiated a treaty to control the zone around the canal. When the Americans started construction in 1904, they had several advantages that the French hadn't. In 1881 Dr. Carlos Finlay of Cuba identified the mosquito as the source of yellow fever infections, though his conclusions were not generally known until his theory was confirmed by Dr. Walter Reed in 1900. When the Americans started their work they invested in extensive sanitation and mosquito-abatement programs and built housing for the workers that had screens to keep insects out. With these procedures in place the disease problem was quickly brought under control. Another advantage was that the Americans used a different design for the canal. Under the direction of Chief Engineer John Frank Stevens, the plan was changed from a sea-level design to one that would use locks. A lock is a device that allows ships to move from one water level to another. The lock is usually a chamber with an open top that is only slightly larger than the largest ship it needs to lift. At each end of the lock are large doors that can be closed to keep the water from the higher body from rushing into the lower body. To raise a ship the doors are opened from the lower body and the ship sails in. The doors are then closed and water from the upper body is allowed to flow into the lock, lifting the ship until it is at the same height as the upper body. The doors to the upper body of water are then opened so the ship can sail out. To take a ship from the higher body to the lower body the procedure is reversed. 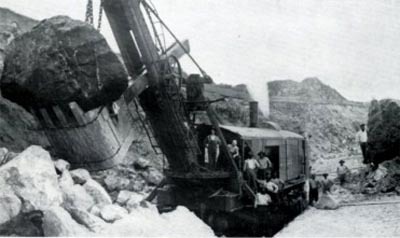 A steam-powered shovel moves rock during construction. The plan called for the Chagres River to be dammed to create an artificial lake called Lake Gatun. Ships from the Atlantic entering the canal would go through a three stage lock that would raise them 85 feet up to the level of the lake. They would then sail 28 miles across the lake, up the river and through a section of the mountains called the Gaillard Cut. At that point another set of locks would drop the ships down to the level of Miraflores Lake. 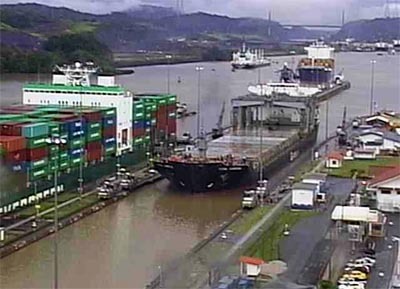 Miraflores was another artificial lake 54 feet above sea level and running for a mile down to another set of locks. At that final 2 stage lock the ships would be lowered to the level of the Pacific Ocean and could sail out into the open sea. The use of locks greatly reduced the amount of material that had to be removed to complete the canal. Even so, it was a tremendous construction challenge. Stevens had the Panama Railway (which paralleled the course of the canal) rebuilt so it could efficiently handle 115 new heavy-duty locomotives and 2,300 railroad cars needed to move all the dirt. In addition, 102 railroad-mounted steam shovels were brought in to actually do the excavation. The most difficult part of the construction was the Gaillard Cut (now known as the Culebra Cut) where part of a mountain had to be removed to make a path for the canal. The difficult conditions there caused the crews to nickname this section of the jobsite "Hell's Gorge." During construction on the cut, a 20-car train filled with dirt was loaded and removed from the area on the average of every one-and-a-half minutes all day long. The canal cost was approximately $375 million including a payment to Panama and buying the rights from the French. It was the most expensive project the United States had ever tackled, but was still $23 million less than a cost projection made in 1907. Between the French and American efforts a total of 268 million cubic yards of earth were removed, more than 14 times what was excavated for the Suez Canal. During the American period, 56,307 people were employed in the construction and there were 5,609 casualties due to accidents and disease. The SS Kroonland is towed through the Culebra Cut by two tugboats in 1915. When Stevens left the project in 1907, Colonel George W. Goethals became the chief engineer until the canal was finished. With a herculean effort the project was completed two years ahead of schedule and officially opened on August 15, 1914 with the passage of the cargo ship SS Ancon. It took about 8 to 10 hours for a ship to make the passage all the way through the canal. The United States continued to administer the canal and the surrounding area for many years after construction was completed. As time went by, however, there was the feeling in Panama that the canal rightfully belonged to the Panamanians, leading to a series of protests in the 1960's and 70's. Finally, a settlement was signed by U.S. President Jimmy Carter in 1977 that arranged for the turnover of the canal to Panama by December 31, 1999. 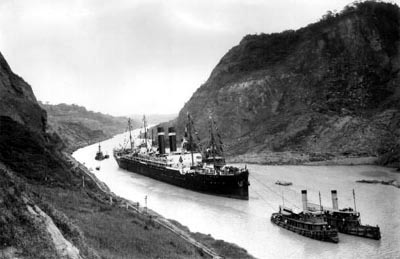 Since that date the canal has been operated by the Panama Canal Authority (PCA), part of the Panama government. Since the canal was completed almost a century ago, the size of ocean-going ships has been getting larger and larger. Many can no longer use the canal which has locks only 110 feet (34m) wide and 1052 feet (320m) long. A ship at this upper limit in size (between 65,000-80,000 tons) is called a Panamax. However, there are a number of vessels now in operation which are much bigger that the Panamax standard, some having lengths in excess of 1200 feet. For this reason there have been several proposals to add a new set of locks to the canal which would accommodate larger ships. In 2007 the PCA selected a design and started on construction of a set of larger locks which they hope to have open by 2014. These will allow the passage of ships almost 1,400 ft (4267m) long by 180 ft (55 m) wide. 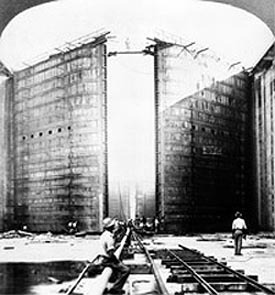 Two of the massive lock doors are installed during construction. Even without the new locks the Panama Canal remains one of the most amazing engineering feats of the 20th century. A ship sailing from New York to San Francisco by the canal can travel less than half the distance that would be needed to go around the tip of South America (5,900 miles compared to 14,000 miles). It has also far exceeded the expectations of those that designed it. In 1934 it was estimated that the canal had a maximum capacity of 80 million tons of shipping per year. By 2009, due to improved equipment and procedures, it handled almost 300 million tons, even without the new, larger locks in place. In 1994 the canal was named as one of the Seven Wonders of the Modern World by the American Society of Civil Engineers. Copyright Lee Krystek 2011 . All Rights Reserved.